Ratings (by number) are given for each trail, and are included at the end of every gpx file name. 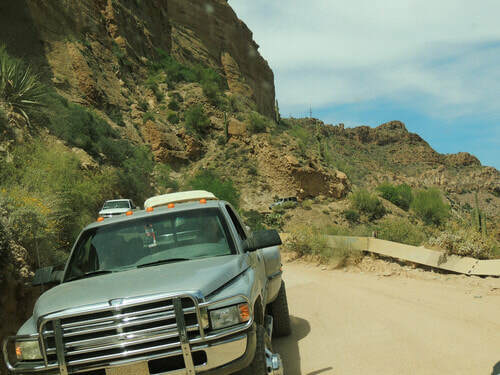 Trails are rated using a combination of trail conditions and vehicle requirements. Ratings reflect the most difficult obstacle on the trail THAT CANNOT BE BYPASSED. Please understand that these rating assume you drive an obstacle correctly. A simple obstacle can cause a tragedy if you drive it stupidly. It is my intention to show only legal trails on this website. If you find I have mistakenly recorded illegal ones, or if you find some that have been closed since I recorded them, please let me know and I will remove them. PLEASE do not use illegal trails. Anything easier than 2.0 is rated GP (Graded - Paved). These may not be super smooth, but they will certainly not require 4WD. Most vehicles with a bit of clearance. 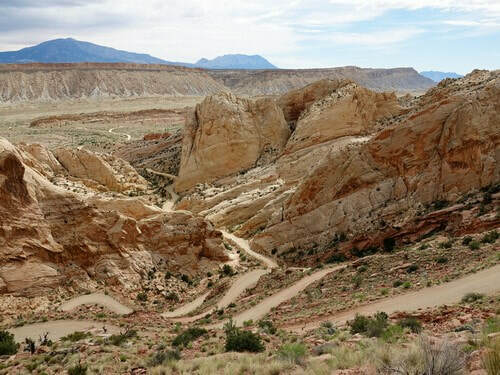 Unimproved or rarely graded dirt road which may have some mud holes and water crossings, small to medium size rocks and loose dirt hill climbs. Easy grades and side hills. Occasional use of 4WD. Stock Wrangler or high clearance SUV. Stock tires. Rutty and rocky road. Slow easy going with 4WD. Low range helpful for speed/traction control and to minimize damage. Some rocks/ledges that require low range and some skill to navigate. Jeep Wrangler or equivalent with upgraded clearance and upgraded tires. Two speed transfer case. Quite rocky or deep ruts. Low-range 4WD required due to terrain and loose traction. Trail may have medium to large rocks and ledges, deep water crossings, and steep grades. There may be side hills that could result in some slippage. Some body damage may occur. Wrangler or equivalent with rear axle traction device (limited slip or lockers). 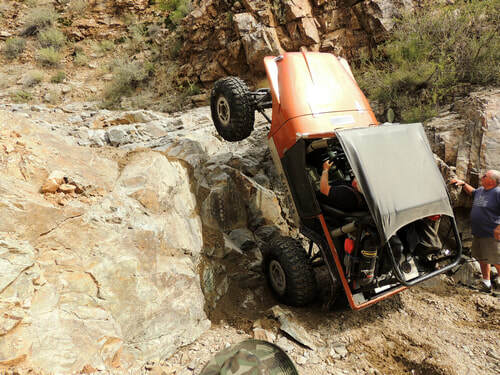 High clearance, 4WD and some skid plates recommended. Aggressive tire tread and method of airing tires up and down. Front and rear attach points. Rocks frequent and large in difficult terrain. 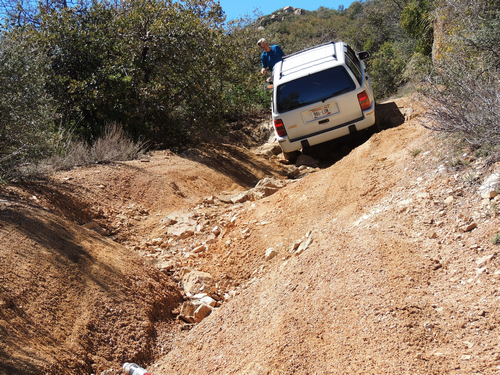 Low-range 4WD required in sections. Steep hill climbs and descents may be required. Obstacles could result in significant body damage. Some obstacles will require traction devices. Wrangler Rubicon with a lift and with good skid plates. Traction device (locker or limited-slip) on both axles. 3 ply or more on tires strongly recommended. Trail badly eroded or in very difficult terrain. 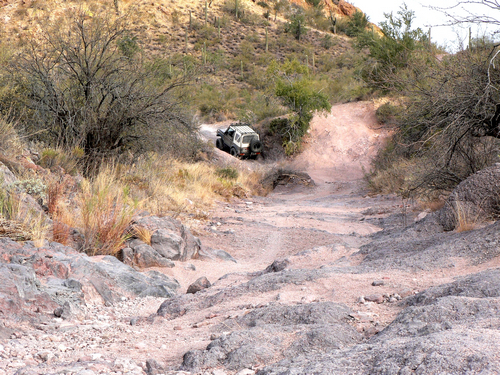 Obstacles will require technical driving skills to negotiate. 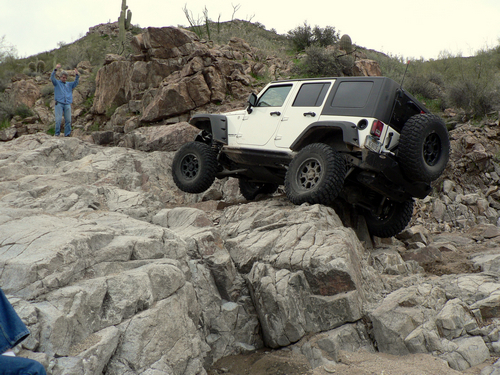 Very large rocks and deep ruts will require traction devices. High ground clearance and skid plates required. Body damage very possible. Fully modified vehicles with oversize tires, excellent articulation, high ground clearance and lockers on both axles. Do not take trails this rating and higher unless you know what you are doing. Severe trail with potentially dangerous sections. Body damage, mechanical breakdown, rollover possible. Significant obstacles that will require technical wheel placement and experienced drivers. Parts of trail may result in vertigo or other signs of distress. Winches recommended. Full Roll cages and other body protection strongly recommended. Extremely rugged trail through virtually impassable terrain. 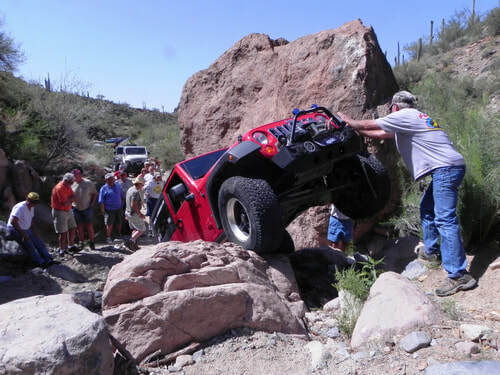 Winching is required in at least one point on the trail. Body damage, mechanical breakdown, and/or rollover probable. Will be a challenge to many wallets. Winches and spare parts required. Spare fluids and welding capabilities recommended. Very tall suspensions, trail tested and fully modified vehicles only. Extreme trails. There are only a few of these on this site. We cannot do them and only have them on here so you know they exist.